Our free article spinner has now been around for almost 3 years! It’s undergone a large number of changes in that time but all the initial power still remains. Our article spinner is extremely simple to use and completely white-hat! No tricks or black-hat stuff here, simply provide your original article, then provide a few variations for the sentences and/or paragraphs in your article and click spin! You’ll have hundreds of unique various created within minutes that you can then submit to article submission sites. 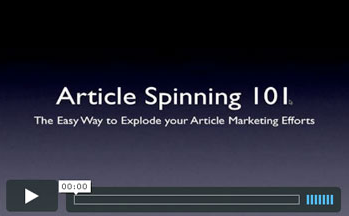 I’ve had a number of questions on the basics of article spinning so I even created an article spinning overview video of the basic concepts and strategies for you to check out if you’ve never tried article spinning before.